Frangipani House is an exotic fairytale house set by an enchanted forest... Jacaranda Cottage is a zany hot-pink cottage close by... both offer a dream holiday come true! Relax in Air-Con amidst fascinating curios, sleep in starry romance, frolic in a tropical hot-tub jacuzzi, enjoy a fabulous outdoor entertainment area... exotic swimming pool with wading area for littlies, spacious lawns & gardens for kids to run and play, funky outdoor wood-fired pizza oven. Dine alfresco on the Piazza Terrace under the magic of fairy lights, delightful garden pavilion overlooking croquet & games lawn. Ride a horse into mountains & rainforests, safe horses & cute ponies for kids, friendly helpful guides, see mischievious donkeys ... a happy farm atmosphere with ducks & exotic birds to feed. Cycle into the village, (kids and adults size bikes) ...plus a tandem-for-two ...bushwalk into national park & explore historic railway tunnel, discover local aboriginal history, share family holidays, romantic retreats, celebrations.... escape into paradise, relax & enjoy the star-spangled atmosphere! 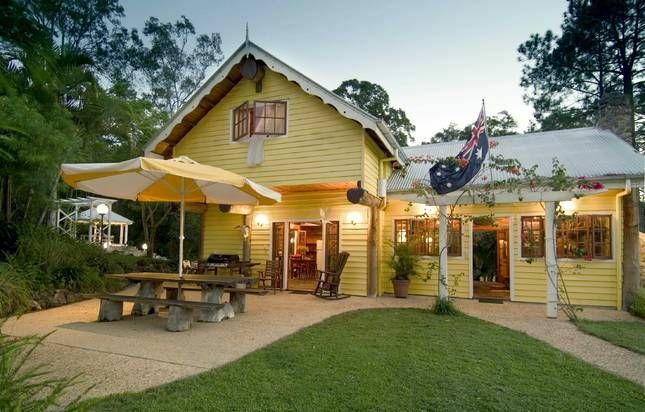 Set on Queenslands Sunshine Coast in the heart of beautiful horseriding country. Treks available daily. Glorious mountains & Mooloolah Valley to explore. Enjoy a massage & beauty treatments in the delightful garden pavilion. There's a fabulous log-fire to warm chilly winter nights. Relax in the hammock in the garden & enjoy a good book. Frangipani House is close to shops, cafes, restaurants... cycle into the village on kids & adults bikes. Tours available to famous markets and wineries. Fabulous sandy beaches, great fishing, & renowned restaurants.. it's an exotic country paradise! Mooloolah Valley offers dinky-di Australian adventure... with horseriding treks every day, safe horses for adults & cute little ponies for kiddies. It's true 'dude-ranch' style! Discover the pleasures of horseriding with friendly guides giving expert advice. Take a day-trek through picturesque mountains & rainforests & visit a country pub for lunch. See our hero Steve Irwin's beloved Australia Zoo, just 20 minutes away. Aussie World is close by for sideshow fun & games & Aboriginal Cultural Souvenirs. Underwater World makes a great day-out ... play golf on world famous courses.. see mysterious Glasshouse Mountains & learn local Aboriginal legend of the Glasshouse Mountains. Many local arts & craft markets to visit, including famous Eumundi markets. Oh My goodness ... YES ... Lorna & her lovely family! Wow!! What an amazing place to holiday!! We were a group of 10 (2 families of 5) with children aged from 15 years to 8 months. We loved the house, it’s Country charm instantly soothes the soul and brings a sense of peace. The bits and pieces collected from all over the world, the claw footed bathtub and mermaid shower, the fireplace, jacuzzi, geese, Gypsy trailer - it ALL added to the excitement. Atalanta is the most beautiful host, we instantly felt ‘at home’ and welcomed. We especially love her pink boots! We had a terrific 1 hour horse ride with the kindest and most helpful guides who also took our 18 month old on a pony ride. I cannot recommend Frangipani Country House highly enough... it doesn’t matter if you’re there to rest and relax or for more excitement - this place caters for everyone! We can’t wait to come back one day!! I was in love from my first glimpse of the Story-Book styled ‘Frangipani House’. Staying and playing in it was like a dream come true. Frangipani House is fun, is kooky and full of history about the old Arrowroot Mill and surrounding area. Old Items have been collected and lovingly arranged to create a special hideaway which helps transports you to the magical lands of your imagination. This is the place to go to when you want to be transported to someplace extraordinary. A place away from posh/modern day units, but still have the luxury of a beautiful in-ground pool and private heated Jacuzzi, and with themed bath and shower rooms. With a spiral staircase taking showplace in the middle of the house sets you in the scene of ‘magical places’. Walking the pathways will lead you to more amazing discoveries. Some of our group went horsing riding for the first time, riding though the historic areas of the surrounding land. They had a fantastic time. ‘Atalanta’ the lovely owner and hostess was so welcoming and always ready to assist if we needed anything. She has created and is still creating a magical land to play and have fun in. I’m in love with this place and will always remember how special this place made our weekend away with our girls. Thankyou Atalanta for sharing your beautiful place. Fantastic location to have a girls weekend away. Loved the loft sleeping area, pool, spa, gazebo and pizza terrace! Atalanta was a warm and welcoming host and very helpful and accommodating. We had an amazing time in the house. It is super quirky and loads of fun for everyone.